SPORTING CLUB C.D. HUELVA 3 - 1 OVIEDO MODERNO C.F. 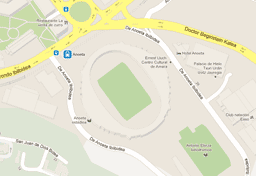 Atsedena - L´ ESTARTIT U.D. REAL JAEN CLUB DE FUTBOL 4 - 1 EIBAR S.A.D. L´ ESTARTIT U.D. 3 - 1 SEVILLA C.F. EIBAR S.A.D. 0 - 4 L´ ESTARTIT U.D. REAL JAEN CLUB DE FUTBOL 2 - 1 OVIEDO MODERNO C.F. SEVILLA C.F. 7 - 1 EIBAR S.A.D. OVIEDO MODERNO C.F. 1 - 3 L´ ESTARTIT U.D. SPORTING CLUB C.D. HUELVA 0 - 2 SEVILLA C.F. SEVILLA C.F. 0 - 1 OVIEDO MODERNO C.F. REAL JAEN CLUB DE FUTBOL 1 - 2 L´ ESTARTIT U.D. MALAGA C. ATLETICO 0 - 0 SEVILLA C.F. OVIEDO MODERNO C.F. 2 - 1 EIBAR S.A.D. MALAGA C. ATLETICO 2 - 2 EIBAR S.A.D. REAL JAEN CLUB DE FUTBOL 0 - 2 SEVILLA C.F. Atsedena - OVIEDO MODERNO C.F. SEVILLA C.F. 2 - 1 L´ ESTARTIT U.D. MALAGA C. ATLETICO 1 - 2 OVIEDO MODERNO C.F. L´ ESTARTIT U.D. 3 - 1 EIBAR S.A.D. SPORTING CLUB C.D. HUELVA 1 - 2 L´ ESTARTIT U.D. EIBAR S.A.D. 0 - 4 SEVILLA C.F. L´ ESTARTIT U.D. 5 - 0 OVIEDO MODERNO C.F. MALAGA C. ATLETICO 1 - 3 L´ ESTARTIT U.D. OVIEDO MODERNO C.F. 2 - 2 SEVILLA C.F. SPORTING CLUB C.D. HUELVA 3 - 0 EIBAR S.A.D.